The luxury cruise ship Europa, ordered by the German operator Hapag-Lloyd, was delivered on September 1999 at Kvaerner Masa-Yards' Helsinki New Shipyard. The 28,400 gross tonne ship carries only 408 passengers, which makes it one of the most spacious cruise ship on the market (69.6 GT/ Pass.). Europa is intended for the luxury cruise segment of the German speaking market. The ship was designed and built in a record short time of slightly over 21 months from the signing of the contract. The public areas on Europa are placed on deck 4 (Europa-Deck) and on decks 7 (aft part) (Sport-Deck), 8 (Lido-Deck) and partly on deck 9 (Bellevue-Deck). 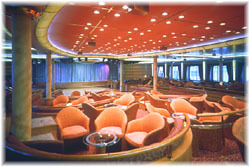 The ship has been built to the "all outside concept", where all passenger suites are facing the sea. The passenger suites are placed on the entire deck 5 (Pazifik-Deck) and deck 6 (Atlantik-Deck), the forward part of deck 7 and 9 and on deck 10 (Penthouse-Deck) in the forward part of the ship. The layout of the ship is designed by the owner and yard together, the owners consultants DeltaMarin, and the owner's architects Yran & Storbraaten and consulting architect Wilfried Köhnemann. The vessel accommodates 408 passengers and has a crew capacity of 270 persons. The passenger suites are in total 204. Of these 168 (82%) are fitted with balconies. There are two 60 sq.m Penthouse Grand Suites with day room, bedroom, bathroom with sauna, and balcony and ten 45 sq.m Penthouse Deluxe Suites with separated bedroom; 156 Veranda Suites of 27 sq.m. (two of which for disabled persons), and 36 Outside Suites without balconies, of 27 sq.m.. Except for the largest twelve suites, all passenger cabins have been prefabricated by Kvaerner Masa-Yards' Piikkiö Works. The main entrance is to the main Atrium on deck 4, with reception desk and offices, as well as a Piano Bar. The Atrium extends over seven decks all the way up to deck 10, and is fitted with two glass-walled lifts. Forward of the Atrium is the Grand Lounge with stage and dance floor and seating 409 guests. Aft from the Atrium is the Promenade area, on the sides of which are the Ships Bar and Cocktail Lounge (seating 138 plus 13 in the bar forward), the Casino Royale (with one black jack, one roulette and 23 slot machines), the Havanna Club (seating 33 + 6 in the bar), the Promenade Lobby and the Boutique. Further aft is the restaurant area, dimensioned to accommodate all the passengers in one seating. 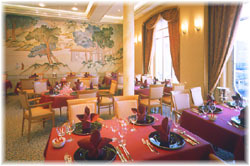 The main restaurant is the largest Europa Restaurant, seating 336, forward of which, on each side are the Venezian and Oriental speciality restaurants, seating 44 and 32 guests respectively. The three restaurant can be combined into one, by removing the dividing walls. 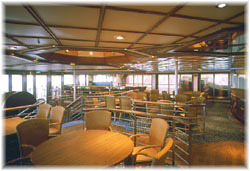 The restaurants are served from the galley area placed at the deck below with storage rooms also on one deck further down. The crew access between the galley and restaurant area is arranged with two pairs of escalators. These are mainly cabin decks. The Atrium on deck 5 also serves as the secondary entrance and includes a photo shop and photo gallery. Cabins are in the fore part. Behind the cabin area is the Europa Spa, including a Gym and Aerobics area, a beauty saloon, a solarium and massage and sauna/steam bath facilities. Further aft is the golf simulator and a putting green, a hobby room ( for painting and handicrafts) and the Kindergarten children's play room. On the outer deck aft, there are two golf driving ranges and a place for table tennis. This area also facilitates the four tenders/lifeboats, two rescue boats with water-jets, and seven smaller rubber pleasure boats with outboard motors for water sports activities. The main sun deck is divided into two parts, the aft part of which can be covered with a glass roof (magrodome) and closed off with a rectractable wall in cooler weather conditions. In the aft area there is the main Lido Pool and a jacuzzi. The forward section of the main pool is in the open air section, which also facilitates a Pool Bar and a stage (Band Stand). Forward on the Lido Deck, there is a cinema/conference room seating 44 guests, a large library and forward the Club Belvedere lounge seating 167 guests with bar, dance floor and a panoramic view. 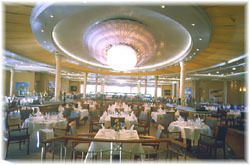 In the aft end of the ship there are the Lido Café and Lido Bar with indoor and outdoor sections. The Sonnendeck sun bathing area is placed in the stern above the cafe' area one deck below. Surrounding the pool deck below is the Sunwalk, and forward there are 14 passenger cabins as well as the captain's and chief officer's cabins and day rooms behind the ship's wheelhouse. The Penthouse Deck in the forward part of the ship facilitates the two 60 sq.m Penthouse Grand Suites with day room, bedroom, bathroom with sauna, and balcony, and the ten 45 sq.m Penthouse Deluxe Suites, arranged with a separated bedroom, all with balconies. Except the captain's and chief officer's cabins, behind the ship's wheelhouse on deck 9, and senior officer cabins on decks 5 and 6, the ship's officers and crew is accommodated forward on deck 3 (officers' cabins with windows plus crew cabins) and deck 2 (crew cabins). In addition to the ship's other technical spaces on decks 1 to deck 3, there is also, on deck 3, the hospital, tendering platforms, the engine control room, the galley area, crew and officers' mess, and the two Azipod-room aft, and on deck 2, the cyclo-converters placed aft, behind the lower food storage area. Crew recreation room with bar and a gymnasium is arranged on deck 4 forward. Europa has a gross tonnage of 28,400, an overall length of 198.6 m, a maximum breadth of 24 m and a design draught of 6 m.
The propulsion machinery is diesel-electric with two azimuthing Azipod rudderpropellers. There are four medium speed main engines with a total power of 21,600 kW (29,370 hp). The speed of the vessel is 21 knots.